Child's Play is not my favorite slasher series by far, but I think they did good with this new DVD release. It has extra that delve deeper into the film, such as about the original concept and about the special effects, which were cutting edge at the time. Those featurettes helped me to appreciate the film a bit more, though it still isn't one of my favorite series in the slasher genre of horror flicks. I really enjoyed hearing about the original concept, which was still about a killer doll, though the consciousness of the little guy didn't come about be means of a serial killer speaking a voodoo chant as he was dying in a toy store. Rather, the kid who owned the doll cut their fingers and put their hands together for some sort of makeshift blood brother bonding experience, and then the doll comes to life and starts killing all the people that the boy wants dead. Actually sounds like a better movie to me. Flash forward to later that night. The kid... guess I probably should start using his name... Andy loves his gift, so he plays with it while his mom heads back to work and her best friend babysits. Once it becomes time for bed is when the weirdness starts happening. While Andy is brushing his teeth, the television mysteriously turns itself on, and she finds the doll, now known as Chucky, sitting in the chair watching it. She scolds Andy... and then dies. Okay, okay, so there's a little something that happens in between, but you wouldn't want me to give it all away. When Andy's mom arrives home, she sees all these police cars and everything in front of her building, and rushes to make sure her boy is okay. The detectives break the bad news to her, and ask her about these tiny doll-sized shoeprints on the countertop. Obviously she has no idea where they came from, but what gets me is that she doesn't even care. Hm, some mysterious prints on the counter right near where your best friend mysteriously and violently died... well, all seems fine here! I mean what the hell?! She then kicks all the cops out of her place. Maybe detectives worked differently back in the 80s, but it seems like nowadays they wouldn't even allow her to stay there until they documented absolutely everything and were able to figure out precisely what happened. The next day, Andy cuts school. Did I mention he is like six years old? Yeah, but he manages to sneak out. Why? Because Chucky convinces him to. I'm sure he knows that he mom wouldn't approve, nor would anyone else, and that he would probably get in a lot of trouble if he was caught, but hey, don't you always do what your toys tell you to do? So he takes the subway (I guess kids ride free?) to some craphole part of town to find a guy who had been partners with Chucky... uh, before he became a doll. This is the first time we really get to see that Chucky is alive... as if this was supposed to be some kind of shock or something. Anyway, Chucky finds and kills the dude, and next thing you know we are at the police station, where they apparently have Andy and want to put him in some mental hospital, seeing as how he keeps insisting that his doll is alive. Let me take a moment here to voice my real beef with this movie... it's the kills, which I've just always found to be quite weak. The first death, the one of her best friend, was completely unbelievable. I didn't buy it for a second. I don't think the cause and effect scenario there would have taken place like that. I think she would have been freaked out and had a headache, but that's about it. Then the second death, the one of Chucky's parter, also didn't feel like it rang true. First off, it looked like an abandoned house that he was living in, so why would the gas still be on? And second, I really don't think the explosion would have been that massive. I think at most he would have gotten some painful burns, but I highly doubt he would have been turned into a crispy critter. But those two deaths pale in comparison to the absurdity of the next death, which is of the voodoo master who taught Chucky how to transfer his existence into another body. Was it by knife? Nope. Gun? Nope. Another explosion? Nope. Pushed in front of a car? Nope. Give up? It was a frakin' voodoo doll! And guess what? That's the last kill of the film. So for a movie about a killer doll, there really isn't a whole lot of killing going on. Give me the Friday the 13th films any day! My wife prefers the Nightmare on Elm Street series, which I would also take over the Child's Play saga. But the kills aren't the only reason. It also becomes obvious at times that the Chucky we're seeing on screen isn't the same Chucky that we just saw a few seconds ago. I know they use different animationc puppets, and even a little person dressed as Chucky, depending on what Chucky needs to be doing in the scene, but when it looks different, you quickly get taken out of the movie, and that really hurts the suspense. They are apparently doing a remake of this film, and will continue to use animatonics rather than CGI, so I really hope with today's technology that they are able to fix this flaw, as even though I'm not a strong fan of this film, you can bet I'll be out there in the theater to see the remake. In addition to the extra features that I already mentioned, this release also includes a couple of commentary tracks. The first one features Catherine Hicks (the mom) and her husband Kevin Yagher, who designed the Chucky doll. The two actually first met on the set of Child's Play, and now they have been happily married for many years. What a sweet story! 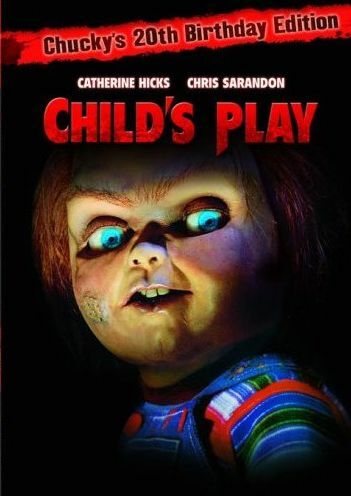 The other commentary features David Kirschner (the producer who got the ball rolling on the film) and Don Mancini, the screenwriter who actually created the character of Chucky. Then there is also a photo gallery, as if anyone ever cares about those. So all-in-all, not a fantastic film, but a good release for those of you that are fans.